Name a Great Great War Film. ’All Quiet on the Western Front’? ‘Lawrence of Arabia? ‘The African Queen’? Whilst all of these are indeed Great, there’s one film that consistently rates higher than them in film polls around the world. In 1958 at the Brussels World Fair a massive, global film poll was organised. Critics and experts from every corner of the globe, 2000 odd in total were surveyed. It was the first of its kind in an age where that kind of thing would’ve been an absolute nightmare to arrange. Guess what came 5th on the list behind ‘Battleship Potemkin’, ‘The Gold Rush’, ‘Bicycle Thieves’ and ‘The Passion of Joan of Arc’? That’s right, Jean Renoir’s ‘La Grande Illusion’. For those who don’t knows, Director Jean Renoir was the son of Artist Pierre-Auguste Renoir. His films have a style all of their own. Partly this is the result of Poetic Realism, a French film style of the 1930’s that was a theatrical response to the New Objectivity movement coming out of Germany from the late 20’s. Jean Renoir’s stylised worlds resemble our own but with cartoony flourishes and embellishments. The characters have the recognisable traits of our friends and family but are also, somehow, melodramatic and ethereal. The stories are old school tragedies with a modern twist. The protagonists, clowns with lipstick on their collars and a tear in each eye. It’s a simple enough story on the face of it. We have a group of French Soldiers who have been thrown together having been captured by the Germans. They make their way through various prison camps taking it upon themselves to make escape attempts at every opportunity. 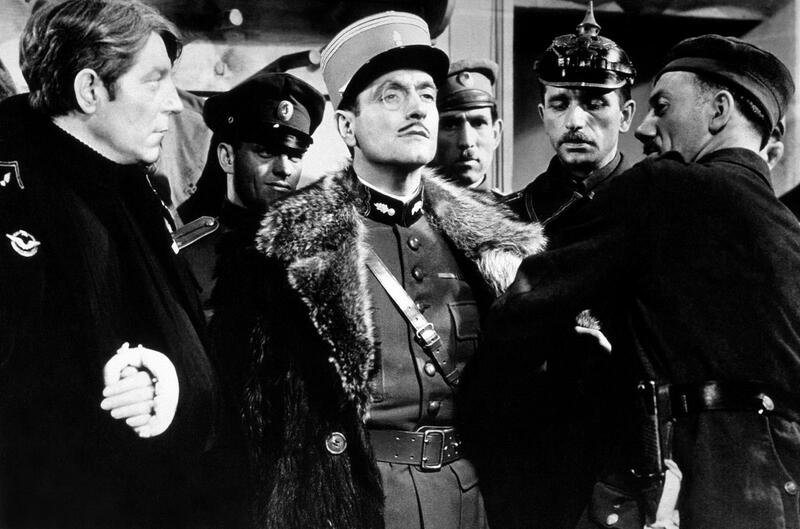 The interactions between the French and their captors is the majority of what the film is all about and it is written in a way that portrays the tense political situation of both the Great War era and the mid to late 1930’s. 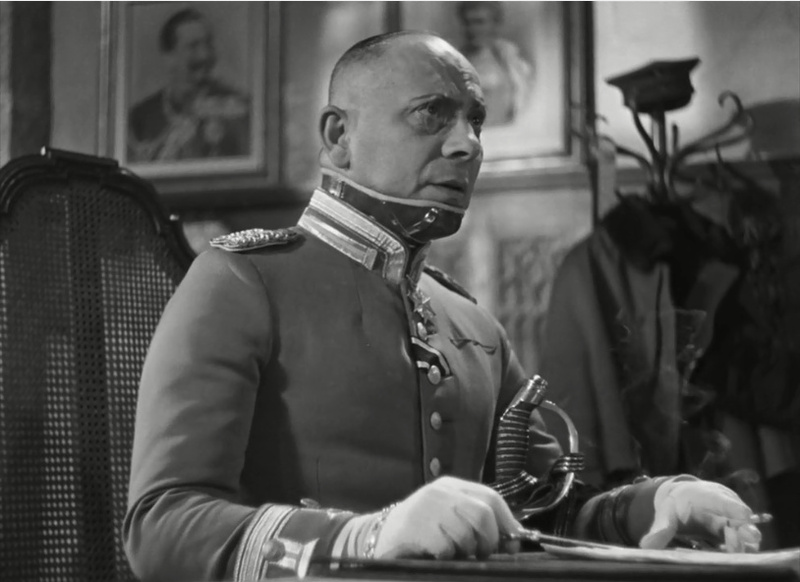 Erich von Stroheim plays a German Aristocrat injured in action, burned and broken with a kneecap made of silver. His chivalric tendencies at odds with his role as Prison Warden. He knows the family of his imprisoned French counterpart and is embarrassed to have to make demands on his liberty. The comparison between French unity, the men all pull together ignoring social standing and wealth, and the Germans strict classist structure is at the core of this film. Stroheim plays the role brilliantly, he is dignity personified whilst at the same time carrying more than a hint of melancholy, a heavy weight on his shoulders for a job he doesn’t want but is doing for the good of his country. Renoir has created a film that holds up a mirror to pre-World War 2 Europe. Rosenthal, a rich soldier from a rich Jewish family is down to earth and humanitarian. There’s a black French prisoner who is basically ignored whenever he speaks. 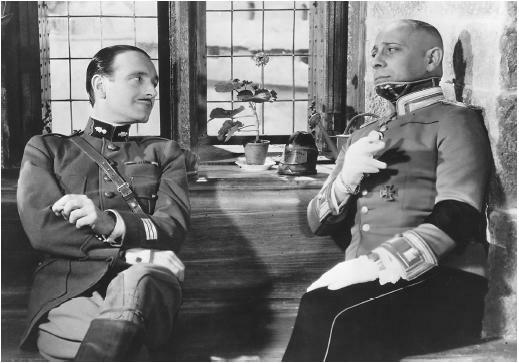 Stroheim and his French counterpart share outlooks and life stories, speaking in a mixture of French, German and English. It appears they are more comfortable in each others aristocratic company than that of their lowly countryman. 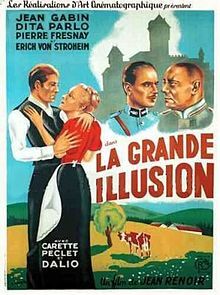 There’s more than a passing resemblance to ‘The Great Escape’ and I wonder if any of the real life characters who were imprisoned in Stalag Luft III had seen ‘La Grand Illusion’. Soil from a tunnel dig is dropped out of the trouser legs. Marachel, one of the French guys, spends a period of time in solitary confinement following a rousing rendition of La Marsellaise. If ‘The Great Escape’ wasn’t based in fact I would be screaming ‘Plagiarists!’ at the production team. It’s almost uncanny. Finally a couple of the guys escape with the help of their Gentleman Aristo who lays down his life as part of a ruse. The film then changes tack a little and becomes more contemplative. The escapees wander for days, argue, make up and eventually happen upon a German Woman who takes them in and nurtures them back to health. Humanity has returned. There is kindness and love and people being nice to other people. Here, in the final 20 minutes, is the message Renoir wants the 1937 versions of us to leave the cinema with. Why can’t we just be nice to each other and all just get along. Sadly, that common sense cry is still profound to this day. It’s a wonderful film. Renoir’s style has so much charm and humanity with the flamboyant touches only adding to the likeableness of the characters. It’s a simple story, with not many twists and turns but it’s told with an eye for the human details and it allows us, the modern viewer, to dip a toe into the cultural zeitgeist of the time. ‘La Grande Illusion’ was DVD001 for the Criterion Collection and I think that is a recommendation in itself. Honestly you simply must see it. Promise me. Don’t die before you watch this film. Clicky Clicky and get it. NOW!